Throughout the sixteenth century, Japan was a place of civil unrest, political intrigue, and war. The power of the Emperor was marginalized as the daimyo fought for supremacy and led their samurai onto the field of battle. The names of these daimyo have passed into legend: Uesugi Kenshin, Mori Motonari, Hashiba Hideyoshi, Takeda Shingen, and Tokugawa Ieyasu. It’s time for you to join their number and restore peace to Japan in Shogun! 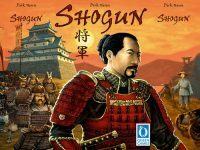 Shogun is a board game of strategic campaigns and fierce battles for two to five players, set in Japan’s tumultuous Sengoku period. You are the daimyo of a great clan, and your destiny is to spread your rule across the country, conquering rival armies, claiming new provinces, and developing your land with castles, temples, and Nô theaters. You’ll need sound tactics to destroy your opponents on the field of battle, and you’ll need the support of your people if you’re going to obtain the rice and money to support your nascent empire. The player with the most victory points at the end of eight seasons becomes the new shogun of Japan and wins the game. Add a Review for "Shogun"